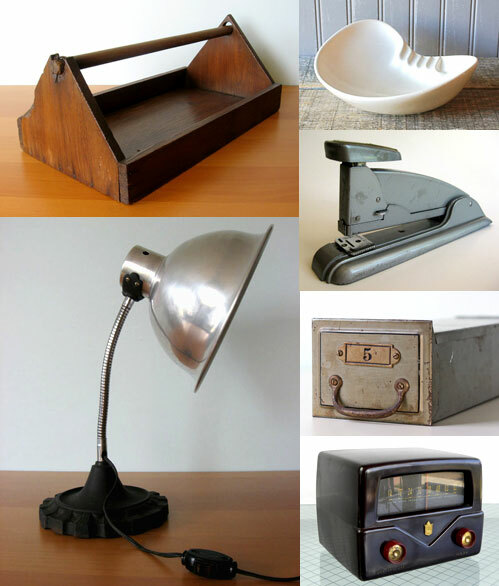 From top left, a vintage tool tote from Vintage Seventy Five, a mid century ashtray by Route 11 Vintage, an old school stapler that works via Tejas Vintage, an industrial file drawer by Bellalulu, a 1950's TV tuner from Cathode Blue, a pair of gorgeous and rare Harry Bertoia Diamond chairs from Jenny and Cody over at Cast & Crew, and an always necessary industrial lamp from Vintage Seventy Five. In this manly closet, we begin with Barton Black Denim jeans from Imogene & Willie, a vintage suitcase found by Free Range Goat, a stylish Oxford Brown Shirt from Billy Reid, black calf boots via Billy Reid, Raleigh Denim jeans, an Emil Erwin handcrafted leather belt in chestnut, a black and red dopp kit via Quirk Gallery, the always fabulous tie by Otis James, and an English driving cap via Billy Reid. Guy minded decor is addicting, starting with this 16mm Film Reel collection via White Pepper, an always needed fan for the hot south found by Old Time Pickers, a worn and rusty red lantern from Free Range Goat, a collection of Popular Mechanics Handyman Encyclopedias from Cathode Blue, vintage red wing boots from Cast & Crew, antique hair care bottles found by Tom Laurus, an old school Hutch football helmet via Vintage Seventy Five, a Rhino trophy from Cardboard Safari, an Instant Coffee ceramic pitcher from Oh Dear Watson and who doesn't love an old matchbox car? This one is a Thunderbird found by the folks at Rhett Didn't Give a Damn.